I have tried creating a new Spring Security project via the New Project wizard and it works great. However, when i have a existing Spring MVC project, i am unable to add Spring Security to it by either adding it as a Framework support or as a Facet support. Is it by design, or is my IDE not setup properly? 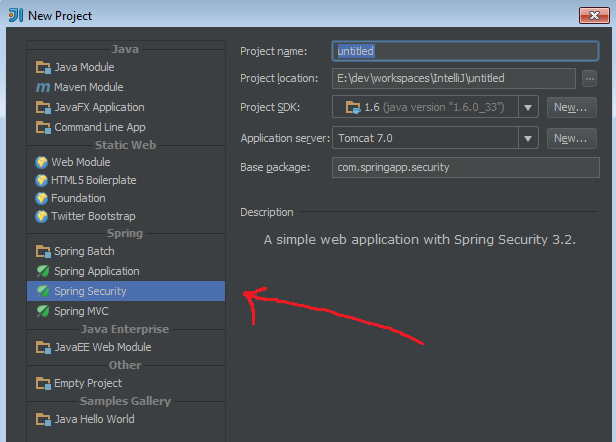 Once again (just to make it clearer), my requirement is to add Spring Security support (appropriate configuration and controller handlers to be created automatically) to an existing Spring web mvc project. I am aware of the alternative way to add dependencies via maven and then code the handlers and configuration myself manually but i am looking for a more IDE way. for Spring Security there is no "setup wizard" like for Spring MVC. If you have any other ideas or proposals, please let us know. OK, that of course is possible. 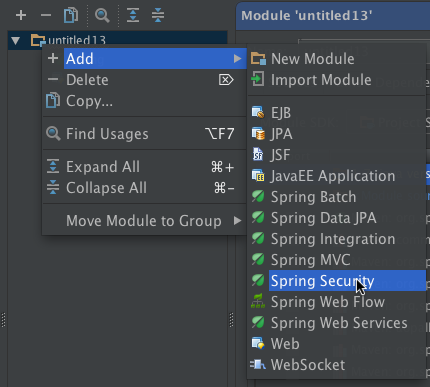 I thought you were referring to integration of Spring Security in non-Spring MVC projects.